One of the biggest concerns of new self-publishers is where to submit their books for review. Fairly or unfairly, most book reviewers are reluctant to review books from self publishers. For this reason many authors go to great lengths to establish a publishing company identity that obscures the fact that their book is self-published. In all honesty, many books that are self-published are not suitable for review and probably never should have been sent to reviewers in the first place. There’s nothing wrong with publishing a book that’s unedited and put together from templates by a publishing-services website, if the book is for your own private use. But the flood of these books has convinced many people—wrongly—that all self-published books are ill-conceived and poorly produced, and the prejudice remains. As publishing continues to open to self-publishers I’m sure many avenues for book reviews will become available. In the meantime, it’s important to conserve your efforts and find the most efficient way to get review attention for your book. Now from what I’ve said above, you can guess that the most important job you have in is to make absolutely certain you have a top-notch product in the first place. If your book has been professionally edited, with a professional book design, and well-produced, you should be proud to send it to reviewers. You’ll want to have a top-notch review package to go with your book as well, but that’s a subject for another time. What I want to recommend to you is to make use of a great resource that’s been put together by Christy Pinheiro on her Step-by-Step Self-Publishing website. Christy has put together an informative list of dozens of review sources who will consider self-published books, as well as links to lists at other sites. 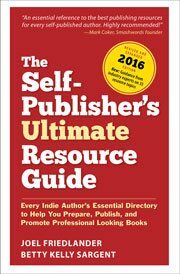 This is a terrific resource for all self-publishers and I encourage you to use it. Now you have a way to find reviewers for your book, so that first review may be closer than you think. I might have missed something? The name of the post is Book Review Sources, yet no sources were listed? Just information about having a good book worth reviewing. Great advice. But not what I was necessarily looking for. And a bit misleading, no? Good advice. I has published a book in Amazon and I will use your advice to market and sell it. I have written a High Temp Alloy Reference Book for those men and women who would like to buy and sell scrap metal. Buying scrap is a skill and one must understand the characteristics of the elements in each alloy and how these elements determine the use or application. The Weighs & Means of Scrap covers all aspect of identification, uses & application, as well as marketing the scrap with one book devoted to uses and applications so the reader can see what is made out of each alloy and how it is used. Available on line in hard-back and E-Book. Thank you for your ideas about this topic. I’ll be sure to consider them in the future. Got the list. I have to say im loving your site very helpful. Another idea is an inexpensive membership to the Midwest Writing Center that gives authors access to the MWC’s free book review exchange service. Love this blog, getting ready to self-publish my book. Was looking for review sources for selfpublishers, but looks like the above link isn’t working. Very interesting information all around the site. Sadly, I must agree with Derek Murphy above to the fact that the link isn’t working. I can recommend the Midwest Book Review to those looking for good, credible reviewers who will review self-published works. They have a very long and extensive list of volunteer reviewers that you can contact, and some of those will even review electronic copies of your book. That should give others a little something to go on until the link above works again. Thanks to Derek and Brian for pointing out the broken link, which has been fixed. In the process I note that Christy has continued to add to her Book Reviewer list and it’s a great resource.